As part of Chris Muir’s ME204 Senior Design class, students discuss various manufacturing processes and how to use the many tools available at the Fabrication Laboratory in Rettner Hall. This fall, Muir developed an approach to teach students how to program a machine tool while working together on a joint project. 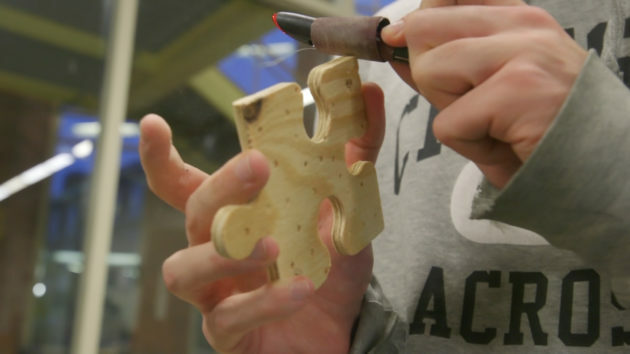 Although the students didn’t know what they were creating until the final week of class, each of them helped fabricate a unique puzzle piece using one of the computer numerical control (CNC) machines in Rettner. When put together, the puzzle, designed by Muir, ultimately formed an image of the iconic crown atop Rush Rhees Library. CNC machine tools function through numerical control. To create the final puzzle, a computer program was customized for each object—in this case each of the 72 wooden puzzle pieces—and the machines control feed rate, location, and tool rotation speed. Each puzzle piece was then identified with a number representing a position in the overall puzzle. In addition, each piece was given parameters to identify each of its four sides, so that a tab could be added, removed, or positioned to interlock with the next piece. Once the part was populated with specifications, the student could write a program to fabricate the individual piece. Students came to the “fab lab” in early November, where teaching assistants Chris Dawson ’16 and Ryan Thomas ’16 oversaw the building of the puzzle. “Number 66!” Dawson yelled out, and Catherine Yip ’17 stepped up while Thomas called up the program for her puzzle piece. Before Yip’s part was cut, a stipple pattern was created with small drill holes on her piece. The drill-hole, or stipple pattern, is a function of a puzzle piece’s position in the overall image. A stipple pattern in this case was used to represent a halftone image as a collection of black dots, and the stipples eventually formed the image of the crown. The student’s program was then run to cut their piece from a slab of plywood. Students were told to sand the edges and fill in the dimples with a black Sharpie to raise the stipple pattern visually when the puzzle was assembled. In the final week of class, the students saw the 36-inch by 34-inch project come together.